A buttery shortbread base topped with glaced apricots & delicious Australian macadamia nuts. NOTE: This product is currently available for sale online with delivery in the Adelaide Metro area. Free shipping for orders of $100 or more. 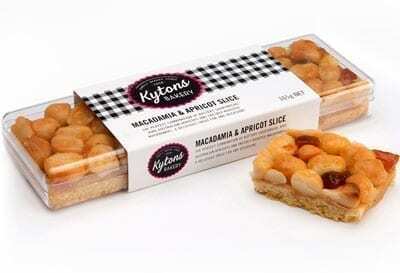 The perfect combination of buttery shortbread, ripe Australian apricots and freshly roasted Australian macadamias. We dare you not to eat the whole block, but recommend you cut into Slices and serve with coffee or as part of a cheese platter. Ingredients: Flour, Sugar, Apricots (12%), Macadamia Nuts (12%), Butter, Glucose, Margarine (vegetable fats and oils, water, salt, emulsifier (471), soya bean, lecithin, flavour, antioxidant (320), food acids (330, 270), colour (160a), Egg, Honey, Water, Milk, Baking Powder, Vanilla Flavour.